1. Run the Internet Information Services (IIS) Manager program. It can be found in the Start > Administrative Tools menu. You may have to edit the Start Menu properties to show the Administrative Tools folder. 2. Select the Application Pools item in the Connections pane. 3. 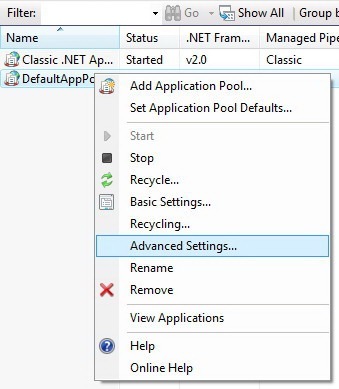 Right-click on the application pool in which you are running your ASP.NET application. On my PC, this was the DefaultAppPool. 4. Select Advanced Settings from the popup menu. 5. In the Process Model section, set the Identity to LocalSystem. Click the OK button. 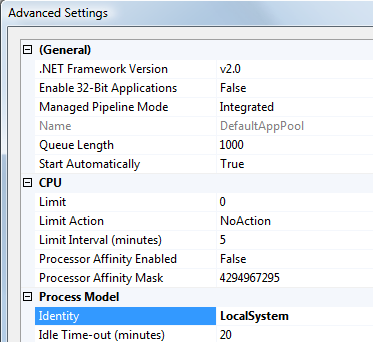 If you selected the correct application pool, your ASP.NET application should now run on your PC without error CS0016.